Each month I travel to the small town of Mill Bay on Vancouver Island to train with my teacher Sensei Douglas Mortley. Sensei Mortley has been teaching Shorinji Ryu Karate, Old Yang Style Tai Chi Chuan, Okinawan and Japanese Kobudo, and Daito Ryu AikiJujutsu for over 30 years. His seminars are open to any interested Martial Artists. For information on upcoming seminars please contact vancouverdojo@gmail.com The weather was perfectly appropriate for being the spring equinox. It was mostly cloudy with irregular showers but the grey skies were punctuated by an occasional glimpse of the sun. In those few moments of direct sunlight you could feel a small amount of warmth creeping in. Winters cold stillness was giving way to Spring's new growth and the reemergence of color in the leaves and flowers of the forest and gardens stood testament to this new season's beginning. It seems obvious to me that this also tends to improve many peoples moods and outlooks. We are after all a part of nature and like nature we all go through times of stillness and growth much like winter and summer. The Dojo was a little chilly when the class began but that was soon alleviated by the warm up. After some simple cardio exercises Sensei had us follow through a new warm up routine he has been doing with his Tai Chi students. This warm-up consists of using a Jo Staff as a hand weight. The Jo Staff, which is a wooden staff around 4 feet long, provides an effective tool for developing strength in the upper body. After this simple yet surprisingly effective warm-up came the usual stretch. Once we had gotten the important preliminary warm-up and stretch finished the seminar really began. Sensei started by having us work on a Tai Chi Push Hands exercise with a particular focus on shifting the feet in and out. This led into a series of applications based on the Push Hands exercise we had been doing. Training with Sensei Mortley in this way often feels like a roller coaster. The information comes at you so quickly it's both incredible and breath taking. Sensei is able to seamlessly apply joint locks, various strikes, throws, kicks, sweeps and numerous other techniques into basic Push Hands movements in a way that is nothing short of masterful. After the Push Hands applications were brought to an end we spent some time reviewing a few of the main Kata of the Shorinji Ryu system. Sensei led us through the 3 Naihanchi or Tekki Kata, Patsai Dai, Jion and Hangetsu. A special focus went into the Naihanchi series. These Kata have become a personal favorite of mine as they brilliantly covey a huge amount of information into a relatively small set of movements. And they do so in a way that can seem somewhat simplistic on first glance. It is said that these 3 short Kata contain a complete fighting and grappling/wrestling system within them and were the foundation of Karate training on Okinawa prior to the 20th century. Finally we ended the seminar with a a two person Tambo exercise sometimes called a Waza. A Tambo is a basically a club. Its a single stick about 2 feet long which is held in one hand. It can be a exceptionally effective weapon when used by a skilled martial artist. Okinawan Kobudo, Aikido, Hapkido and many Traditional Japanese weapon systems all use the Tambo. A fact that demonstrates it's versatility and deadly effectiveness as a weapon. 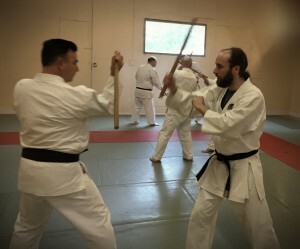 After the two person form we reviewed the single person Kata that the Waza was taken from called Seikun No Tambo and that brought the seminar to an end. It is nearly impossible to adequately covey the information that was covered by such a seminar as martial arts are not something words alone can do justice to. In the span of a few hours Sensei Mortley covered an enormous range of information from the fluid movements of Traditional Tai Chi Chuan to the devastating power generated when properly using a Tambo. Yet despite these varying techniques and concepts Sensei Mortley has an amazing ability to make it feel all like they are different threads upon one great web. As he often says "there is no such thing as an advanced movement in martial arts, rather there is only advanced understanding of basic movements". In between the myriad of techniques being taught at this, or any other seminar, Sensei often takes a moment to address important concepts that are also deeply interwoven into the training. In this seminar the one thing he spoke of that really stuck in my mind was the responsibility that every individual must take to learn about a given subject before drawing up any sort of conclusion. In martial art terms this can mean being careful to not underestimate your opponent. Understanding that combat is far to serious of a thing to allow anything to be taken for granted. As many individuals and armies have learnt, usually too late, over confidence can be like sticking ones neck out against a sword cut. One often loses their head when doing so. It is no different in life. Humanity bleeds everyday due to one person or another holding unreasonable and/or uneducated beliefs. Sensei made it clear that to be a true student of Karate, Tai Chi Chuan, or any other traditional art it was imperative to separate the truth from the nonsense, wishful thinking from viable techniques, and reality from fantasy. Peace came from accepting things for what they are and personal empowerment came from working with reality as it is. A simple task that is far from easy but one worth striving for each and every day for ones entire life. Previous Previous post: Receiving And The Martial Arts.